We’re excited to be back from winter break, and to dive back into our explorations in the Digital Humanities! As a reminder, the DH in CAS website showcases the amazing work of our colleagues on the Scholarly Innovator’s page. Please contact Rachel Rochester to be included on this page. 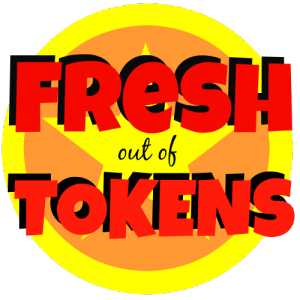 This week we’re excited to discuss diversity in gaming! 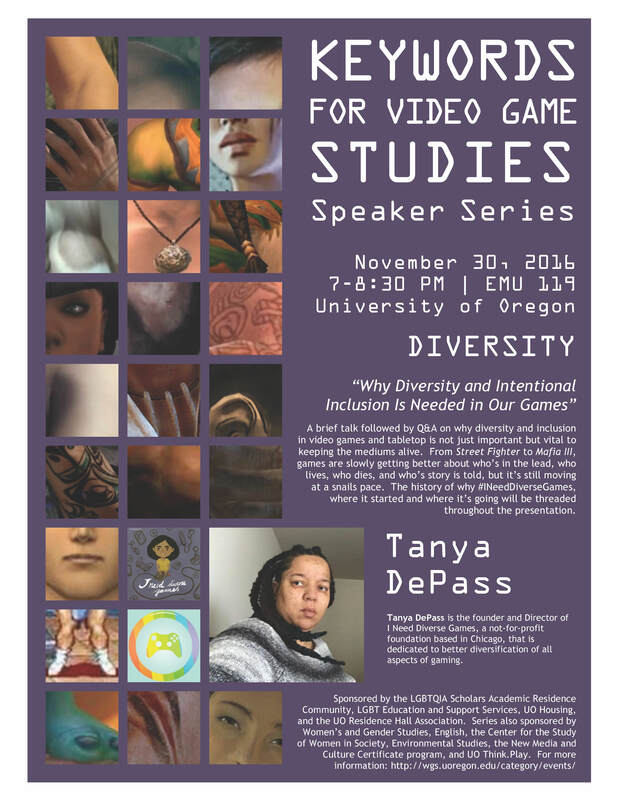 Back on November 30, Tanya DePass gave her talk, “Why Diversity and Intentional Inclusion Is Needed in Our Games,” here at the University of Oregon. The event got us thinking about the nexus of storytelling and gaming, and who decides which stories get told. 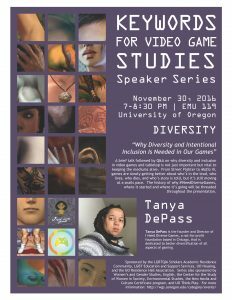 DePass is founder and Director of I Need Diverse Games, which is a not-for-profit foundation dedicated to diversifying all aspects of gaming. In her talk, DePass spoke extensively about the need for more diverse representation and inclusive storytelling in video games and tabletop. 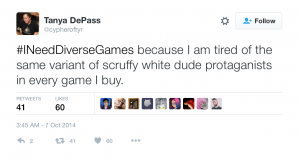 DePass also discussed the history of the #INeedDiverseGames movement, which began with DePass’s tweet of frustration/call to arms back in 2014. In the tweet, DePass writes “#INeedDiverseGames because I am tired of the same variant of scruffy white dude protagonists in every game I buy.” The hashtag trended on Twitter, and shortly after became a not-for-profit organization, overseen by a board that includes industry insiders. For DePass, it’s important to consider “not just who’s playing, but who is making the games,” and being able to bend the ear of game makers might result in more diverse hiring practices as well as the creation of characters who better reflect an increasingly heterogeneous playing population. Within the gaming world, stereotypes proliferate, particularly about which demographics are playing. DePass makes the case for diversity with data, looking at an industry that boasts a disproportionate number of white, cisgender, heterosexual game designers who subsequently assume that their audience is just like them. According to a 2015 study by the Pew Research Center, that’s simply not true: people who are white, black, and Hispanic are equally likely to say they’ve played videogames, and more people of color than white people are likely to self-identify as gamers. Dr. Edmond Chang, who hosted DePass during her visit to UO, recently expressed a similar sentiment with NPR’s All Tech Considered: “The statistics are shifting and telling us that who plays games is no longer this imagined idea of the white straight able-bodied adolescent male who is at home in their parents’ basement. The industry has really failed in certain ways to catch up.” In an industry which has repeatedly argued that issues of representation are logistical – that women are too difficult to animate, or there is no market for games driven by characters of color – these numbers might finally begin to shift the market. 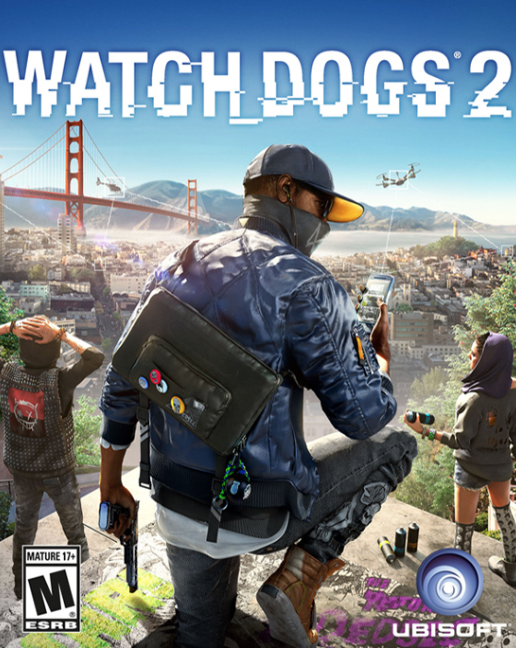 Slowly, DePass sees incremental improvements representation in the industry: games like Watch Dogs 2, Mafia III, and Remember Me show that some creators are beginning to pay more attention to the ways in which they treat issues of race, ethnicity, gender, and sexuality. What videogames are you playing? How do their identity politics hold up under scrutiny? For more, be sure to follow DePass on Twitter (@cypheroftyr) and check out her excellent podcast, Fresh Out of Tokens. To listen to the whole event, stream the audio here, or better yet, subscribe to our podcast on iTunes. Because of the logistics of recording a live event, the audio sounds better on some listening devices than others, but you can hear DePass’s talk and following Q&A in their entirety. DePass’s visit to the University of Oregon was made possible by Women’s and Gender Studies, English, Environmental Studies, the Center for the Study of Women in Society, the New Media and Culture Certificate program, the LGBTQIA Scholars Academic Residence Community, LGBT Education Support Services, UO Housing, the UO Residence Hall Association. and UO Think.Play. I’d also like to extend special thanks to Tanya DePass and Dr. Edmond Y. Chang for allowing me to record the event. You’re so welcome! Thanks for the recording!